The duisport Group is staying the course in an increasingly difficult economic environment. In the 2018 business year, the company generated revenues of EUR 278.6 million. This is 11.6% or EUR 28.9 million higher than the comparative figure of the previous year (EUR 249.7 million). The operating result (EBITDA) improved by 4.9% from EUR 40.5 million to EUR 42.5 million. The net profit increased by 4.3% from EUR 11.7 million in 2017 to EUR 12.2 million. A particularly positive development: The participating interests made a significant contribution to the good result. At the same time, Staake also emphasized the strict strategic focus on quality criteria. In an international field, duisport has established a leading position as a “premium port”. “We focus on quality. The logistics parcels developed by us are premium locations. We also offer diversified and stable value chains. This intense customer focus has made duisport into a networking platform for logistics services. Our customers value this market position as a quality provider, and we will continue to develop this strategy at the global level. Of the four duisport business divisions, the Infra and Superstructure segment generated sales revenues of EUR 54.4 million, which represents a 7.3% increase compared to the previous year's result (EUR 50.7 million). Revenues in the Logistic Services segment increased by 2.1% from EUR 75.8 million to EUR 77.4 million. Similarly, the largest business segment - Packing Logistics - also reported strong growth of 7.6%, from EUR 87.0 million to EUR 93.6 million. In the Contract Logistics segment, duisport generated sales revenues of EUR 24.2 million. In 2018, the duisport Group invested EUR 20 million in fixed assets and financial investments. 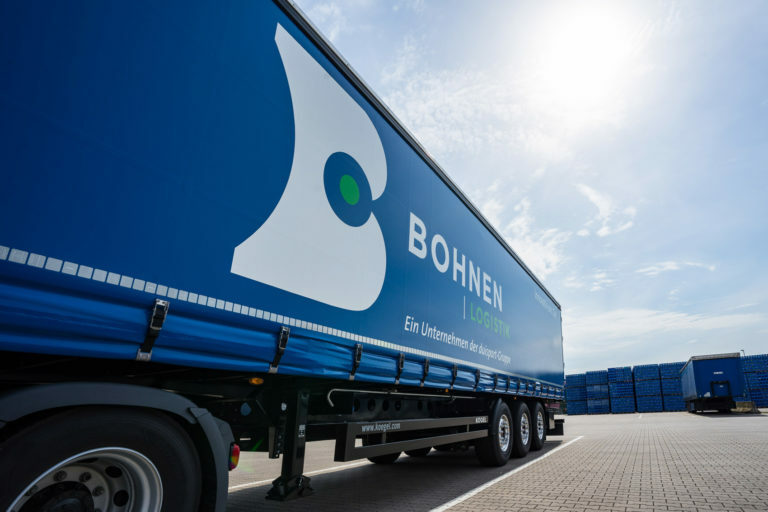 In 2017, this figure was an extraordinary EUR 34 million due to the acquisition of Bohnen Logistik and the construction of the logistics building for Daimler on Duisburg's Mercatorinsel. Total handling volumes, including private commercial ports, amounted to 127.5 million tonnes (2017: 130.6 million tonnes). This represents a decline of 3.0%. In the ports of the duisport Group, handling volumes declined from 68.3 million tonnes to 65.3 million tonnes. Bulk material volumes declined by ten percent due to the low water levels. Particularly the handling volumes for iron, steel and coal declined, while the handling volumes for mineral oil and chemicals remained stable. Container handling, which accounts for 55% of the handling volume and is duisport's most important goods segment, reached the record level of the previous year with handling volumes of 4.1 million TEU. Approximately 30% of the trade between China and Europe transported by freight train is already processed through the Port of Duisburg. This means that the Rhine-Ruhr region is becoming a central hub for the trade between the EU and China. Every week, 35 trains run between Duisburg and a dozen destinations in China. In the last financial year, approximately 130,000 TEU were transported on these trains. Collaborations with Chinese partners are supposed to lead to further growth along the corridors of the Silk Road in the interest of the German export economy. At this time, duisport is primarily involved in the construction of the world's largest industrial and logistics park “Great Stone” near the Belarus city of Minsk. The consortium of European and Asian partners is working to reduce the transport time of the Chinese trains from the current 14 days to 10 days in the medium term. 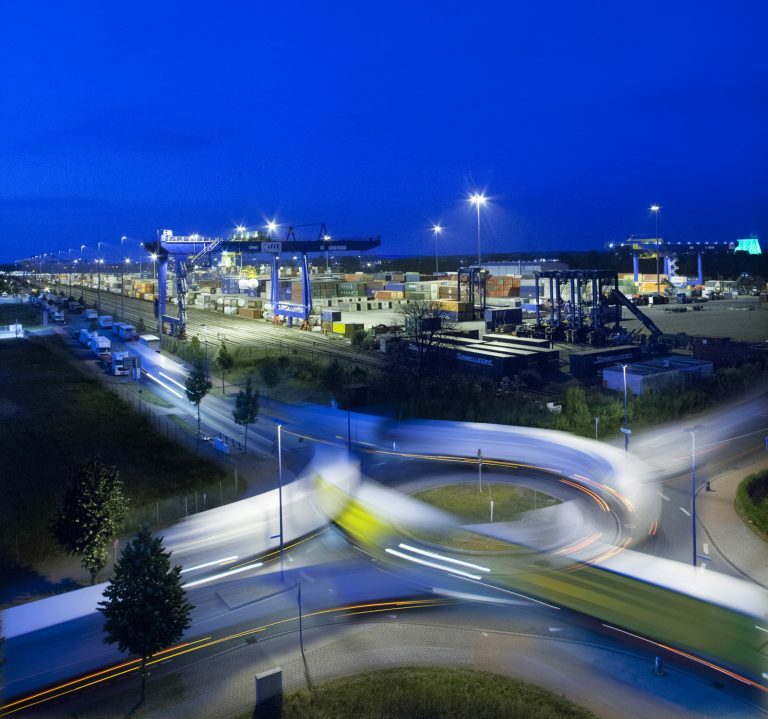 Since the “startport” logistics innovation platform was established by duisport at the end of 2017, a total of 20 start-up companies have been given an opportunity to develop innovative logistics solutions in Duisburg’s interior port. The interest of start-up founders is increasing. At the beginning of 2019, startport exclusive partners Evonik, Klöckner & Co. and Initiativkreis Ruhr were joined by the RAG Foundation and Borussia Dortmund. duisport rounds off its engagement in this sector by actively participating in the Digital Hub of the Dortmund Fraunhofer Institut. duisport and RWE Power AG have joined forces to develop a 53-hectare parcel on land belonging to the city of Grevenbroich and the municipality of Jüchen. The purpose of this venture is to develop a commercial and industrial area on the re-cultivated land of the Garzweiler surface mine. The project is supported by local politicians and the state government as an important step in the structural transformation process. logport ruhr GmbH, a joint venture of duisport and RAG Montan Immobilien, is in the process of preparing a 30-hectare area in Oberhausen for Edeka Handelsgesellschaft Rhein Ruhr mbH. The parcel will be home to a logistics center that will create over 1,000 jobs. The dismantling works on the 40-hectare parcel of the former paper factory have been completed. This parcel will be the future site of a trimodal container terminal located directly on the Rhine. A number of operations have already set up residence. This project is supposed to create approximately 600 new workplaces. At this time, negotiations are already under way for an expansion involving the purchase of additional lots totaling approximately 15 hectares. In 2018, the VW Group concentrated its CKD business for Audi and VW in logport II. This means that Duisburg-Wanheim is now the world's largest CKD packaging center in the group. Daimler's engagement already got off to a successful start. In 2018, duisport was once again successful in marketing commercial and logistics parcels totaling 223,000 square meters, including parcels for Amazon in Kasslerfeld, Flaschenpost in the free port, EMR European Metal Recycling on the Schrottinsel, and TIP Trailer Services in logport III. 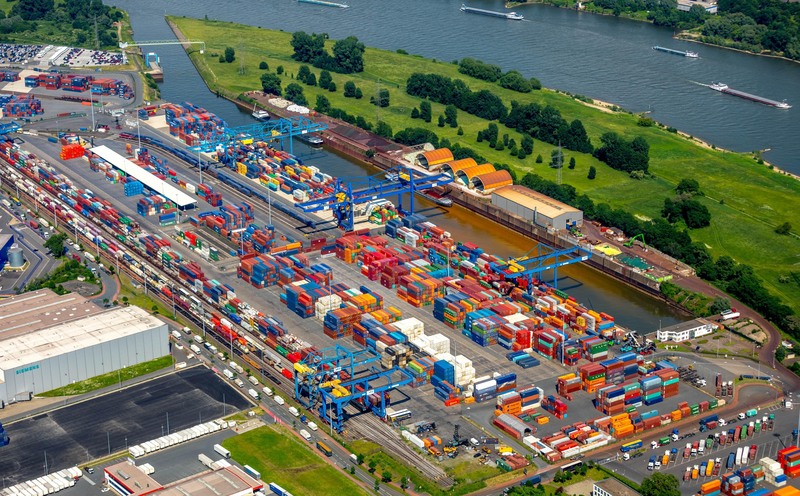 In total, the Port of Duisburg has access to more than 2.2 million square meters of covered warehouse space, which is used by approximately 300 companies that are based in the port. 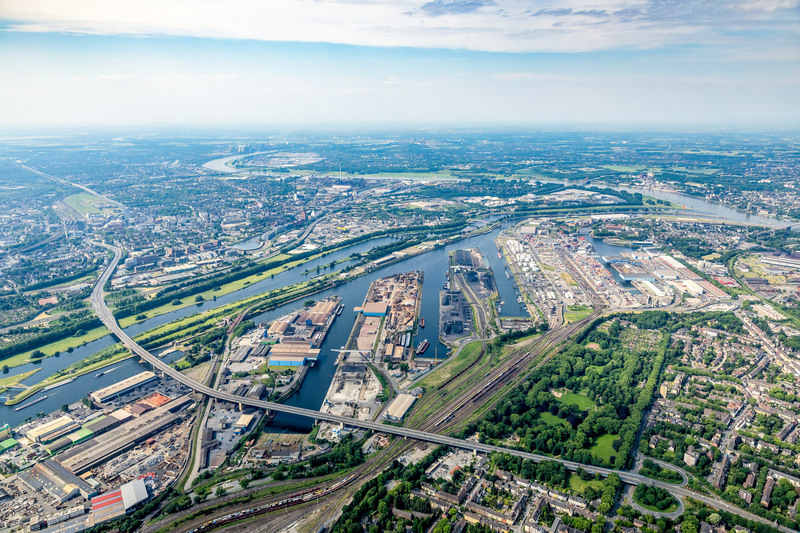 The addition of Amazon and the former start-up Flaschenpost created more than 500 new workplaces in the Port of Duisburg in 2018. 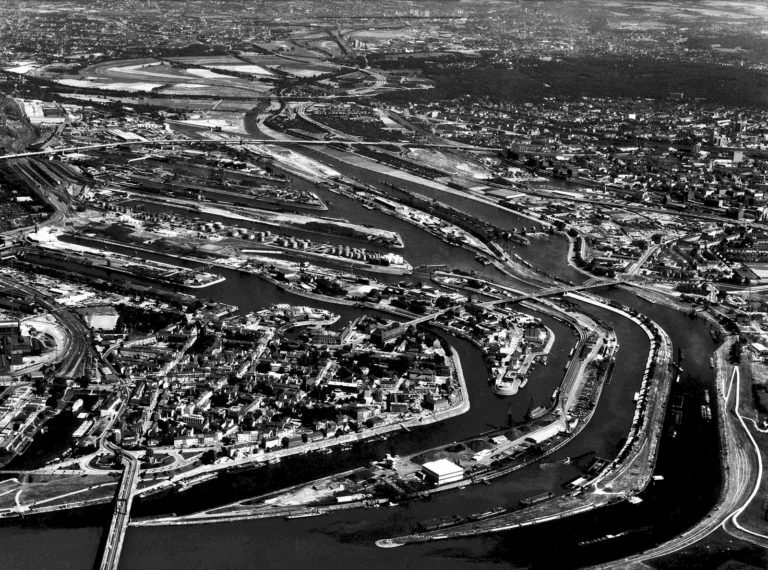 It is estimated that approximately 47,000 workplaces in the Rhine-Ruhr region directly or indirectly depend on the Port of Duisburg. 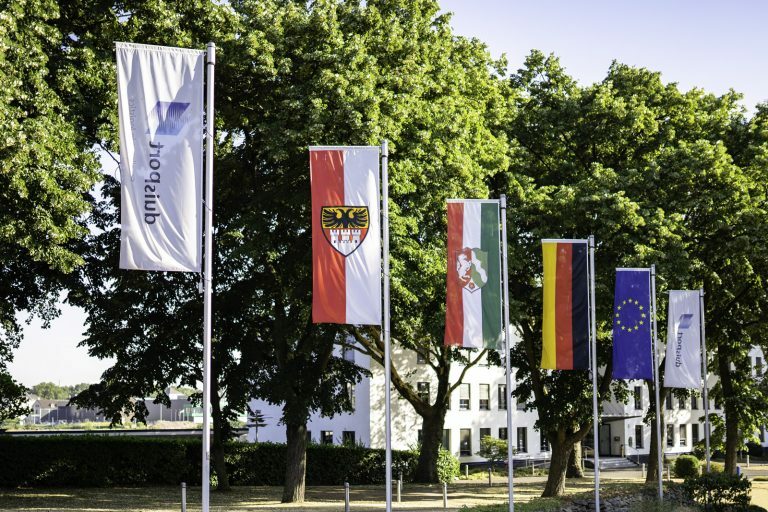 As part of the 2016 cooperation between duisport and innogy to develop the Port of Duisburg into the “Hub for the Energy Transformation”, the first self-adhesive, ultra-light solar film was applied to a building front in the Port of Duisburg in 2018. The film was developed by innogy affiliate Heliathek; this is the first time the film has been used in a port. Three shore power fueling stations operated by innogy were installed in Duisburg-Ruhrort in the spring of 2019. They can supply electricity to up to six moored inland water vessels simultaneously. 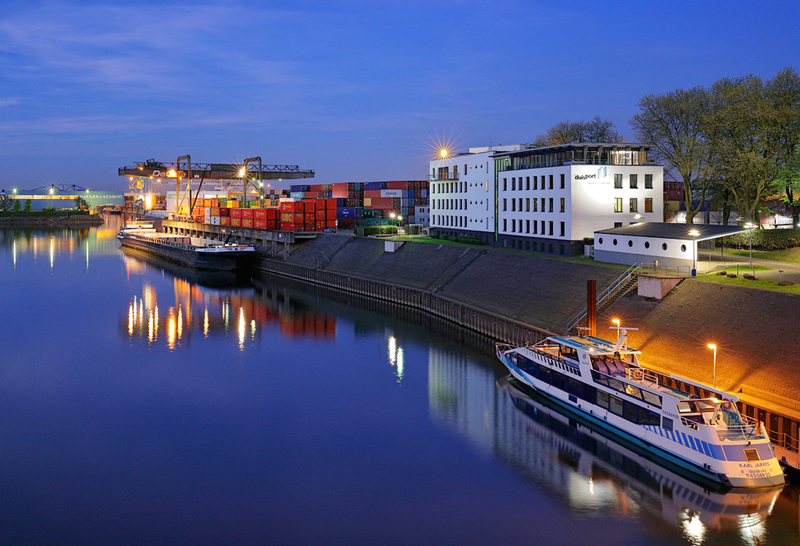 Additional shore power fueling stations for the growing number of river cruise ships moored in the Port of Duisburg are in the planning stage. As part of a joint research project between duisport, RWE Supply & Trading and the University Duisburg-Essen for the environmentally-friendly liquid natural gas LNG, the first retrofitted vehicles went into operation in logport III in 2018. The vehicles are filled with a mobile LNG fueling system. A stationary LNG fuel station is planned in the Port of Duisburg. The lighting for over 100,000 square meters of warehouse space was converted to energy-efficient LED in 2018. The more than 500 luminaires in the port's entire road system will be converted to LED this year.